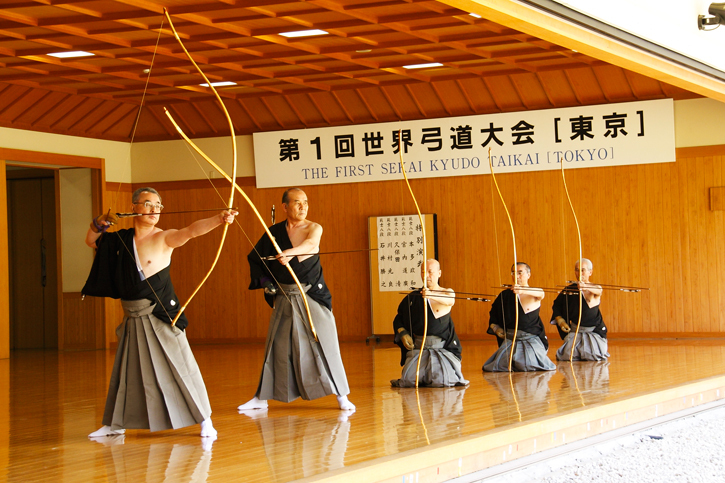 In 2010, the First World Kyudo Taikai, a first for Kyudo, was held at the ANKF Chuo Dojo located inside Meiji-Jingu in Tokyo. There were competitions among teams by country and an individual competition. A total of 18 countries participated in the team competitions. Overseas, the increase of popularity with Kyudo has been centered mainly in the US and Europe. Those who started Kyudo while in Japan or Japanese expatriates living overseas are working to spread Kyudo; in 2006 the International Kyudo Federation was established. Including Japan, there are 17 member states. The members of Team France who were able to pass the preliminaries to reach victory were: Michel Dupont – A truck driver with over 30 years of Kyudo training. 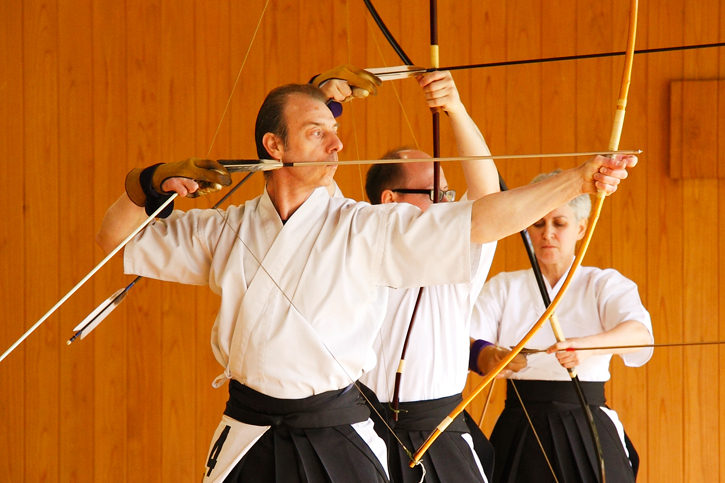 Marc Bertin – A computer software engineer with started Kyudo in 2006. And Patricia Stalder – whom started Kyudo in Japan. Mr. Dupont was fascinated with the Yumi and Ya when he watched the Seven Samurai when he was 18 years old and spoke of being draw into the pursuit of Sanmi-Ittai (Unity of the Yumi, Body and Mind). Mr. Bertin, who has had experience in many martial arts such as Karate, mentioned increasing mental strength was the reason for starting Kyudo. Ms. Stalder started Kyudo in 1994 while living in Ota, Gunma. She stated that the manners in Kyudo are beautiful. 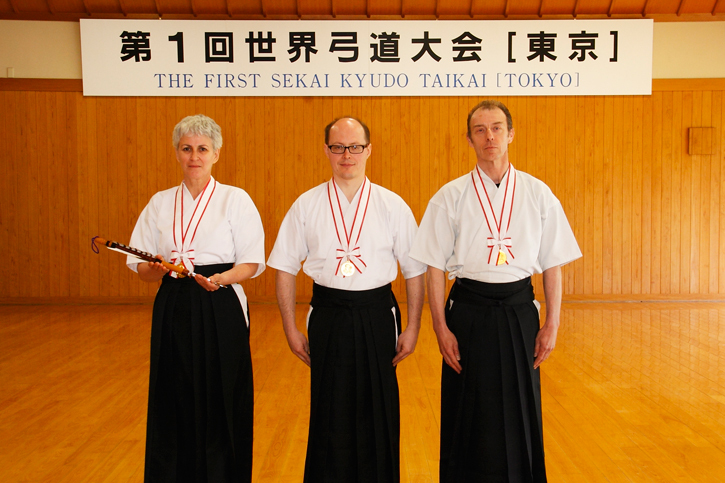 On April 24, 2010, the members of Team France : Michel Dupont, Marc Bertin, Patricia Stalder won the team competition of the First World Kyudo Taikai. With harmony among its members and the beauty of all movements, Team France was achieve Kaichu (all 12 arrows hitting) in the Semi-Finals. It has been 30 years since there has been this type of feat and even moved the Judging Committee. Normally unheard of, even the Judging Committee members cheered along with the crowd to express their awe.